Our Tea Tree Medicated Acne Gel is infused with 100% pure Tea Tree oil which penetrates deeply into skin and helps clear acne and pimples. Recommended for use on whiteheads, blackheads, pimples and acne. Contains 100% pure Tea Tree Oil, a natural antibacterial to help control acne Deeply penetrating to dissolve blackheads and whiteheads Concentrated formula to unblock sebaceous ducts Free of Benzoyl Peroxide for fewer side effects Clear gel for invisible care Has a concentration of 20% Melaleuca alternifolia oil (Tea Tree Oil) - especially useful for problem skin Free from parabens, propylene glycol, lauryl sulphates, synthetic fragrances, synthetic colours, synthetic preservatives and animal derived ingredients DIRECTIONS FOR USE For external use only. 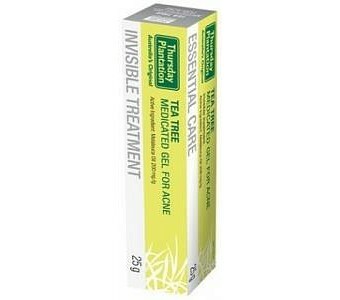 Apply Thursday Plantation Tea Tree Medicated Gel For Acne to acne and pimples morning and night. If skin dryness occurs, apply a small amount of Thursday Plantation Aloe Vera Gel. CAUTIONS AND CONTRAINDICATIONS Always read the label. Use only as directed. Discontinue use if sensitivity occurs. If symptoms persist consult your healthcare practitioner. Contains Alcohol. Do not use internally: this gel has been designed for external skin application. Do not use near eyes: avoid contact with eyes. Seek medical attention if contact occurs. MEDICINE INTERACTIONS Do not use with other acne treatments due to possible unknown interactions.